Lite Ferries is actually the amalgamation of three shipping companies — the Lite Shipping Corporation, the Sunline Shipping Corporation and Danilo Lines Incorporated. The mother company of this combined shipping corporation is Lirio Shipping Corporation which is into cargo shipping. It is not a big shipping company on its own, however, but the big company Lite Ferries started from that. Lite Ferries is connected to Bohol, the place of origin of the founder Lucio Lim which still has various business interests in that island-province including in Panglao development. In a sense, many in Bohol has a new company to root for after the demise of Sweet Lines, the old favorite and pride of Bol-anons. However, the nerve center of Lite Ferries’ operation is now Cebu City although they still use a Tagbilaran address. It is hard not to discuss now Lite Ferries because in this decade its ship acquisitions continued almost yearly and almost always multiple ship in a year and its acquisitions have accelerated since 2009. From a second-tier Cebu passenger shipping company, it now has the most ferries in the Visayas. Their ferries are mainly of medium size for non-liners but with their numbers they now cover more routes and their competitors are now feeling their presence and weight. Lite Ferries started ferry operations in a limited way in 1992 when it was able to acquire the triple-screwed LCT St. Mark, a surplus ship of the US Navy built in 1964 which has limited passenger accommodations like most conventional LCTs. Lite Ferries used this ship to connect Cebu and Bohol via Argao and Loon. Argao is the southern link of Cebu province to Bohol and with it there is no need for a vehicle to still go to Cebu port. In a later renaming of their ships, the LCT St. Mark became the Lite Ferry 20. She was by then a re-engined ship with just two screws. In 1994, Lite Ferries acquired the former Horai Maru No. 12 in Japan and in the company this ferry became the Sta. Lucia de Bohol which betrayed the place origin of the company. This ship was a basic, short-distance ferry-RORO with external dimensions of just 32.0 meters length of 8.0 meters beam by 3.0 meters depth with a Gross Tonnage of 199. Sadly this ship is no longer around. Lite Ferries then acquired the former Hayabusa in Japan in 1996 and she became the Lite Ferry, without a number. This was not a small ship for she measured 88.0 meters by 15.0 meters by 4.8 meters in L x B x D with a Gross Tonnage of 1,389 and she had a Cebu to Ozamis route. Maybe in Lite Ferries this ship was too big for them then and so they sold this ship to Trans-Asia Shipping Lines Incorporated (TASLI) where she became the Trans-Asia II. After this, Lite Ferries was able to acquire the rump of the fleet of San Juan Shipping Corporation. That company plummeted after the loss in an explosion and fire and subsequent sinking of their biggest ship, the San Juan Ferry which was the former Dona Cristina of Carlos A. Gothong Lines Incorporated (CAGLI) and Cebu Ferries Corporation. From San Juan Shipping Corporation, Lite Ferries was able to acquire the Sr. San Jose, a beautiful cruiser but with a weak engine and the John Carrier-1, a basic, short-distance ferry-RORO with problematic engines also. The important thing this purchase gave Lite Ferries were not the ships and these were not used by Lite Ferries for long. Actually, it was the important franchises and route to Leyte which they did not have before and which proved profitable for them in the long run. In 2004, Lite Ferries acquired the Salve Juliana of the MBRS Shipping Lines of Romblon which was then disposing their earlier ships as it has already acquired bigger ones. 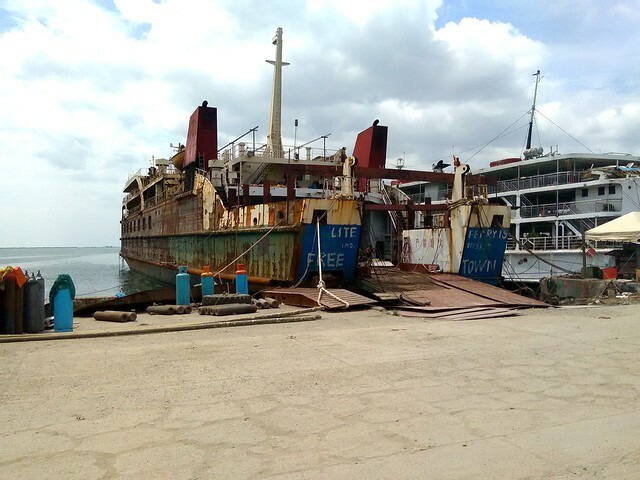 This ship became the Sr. San Jose de Tagbilaran (in that period many of the ships of Lite Ferries were still named after saints) and it seems it is this ferry that displaced the Sta. Lucia de Bohol in the Tagbilaran route. Later this ship was also assigned to the Ormoc route. When the ships of Lite Ferries were renamed to “Lite Ferry”, she became the Lite Ferry 6. The next year, in 2005, Lite Ferries acquired the former Daishin Maru and made her into a small overnight ferry-RORO. Her dimensions were only 42.6 meters by 11.5 meters by 3.0 meters and forward part of the car deck has to be converted in Tourist accommodation to increase her passenger capacity. The ship was first known as the Our Lady of Barangay-1. Her engines were later not strong and she was put up for sale. When there were no takers, Lite Ferries had her re-engined and now she is known as the Lite Ferry 5 and still sailing for Lite Ferries in her original route which is the Tagbilaran route. In 2005, Lite Ferries acquired the former Shodoshima Maru No.1 which was the former Zhu Du No.2 in China. In the Lite Ferries fleet she was first known as the San Ramon de Bohol with a flat bow ramp. Later, Lite Ferries fitted her with a conventional pointed bow thereby adding to her length (but I wonder what other things were gained by that). In the renaming of their ships, this became the Lite Ferry 7. Many will ask where is Lite Ferry 1, Lite Ferry 2 and Lite Ferry 3? Lite Ferries was able to acquire the shipping company Danilo Lines which served the San Carlos-Toledo route in 2006 and the two main ships of that fleet, the Danilo 1 and Danilo 2 became the Lite Ferry 1 and Lite Ferry 2, respectively. The two are actually sister ships and they are actually sister ships too to Lite Ferry 6. Danilo Lines actually has two wooden ships, the Danilo III and Danilo IV but those were not transferred to Lite Ferries anymore which by that time was just sticking to ROROs (well, they even had the Sr. San Jose cut up). The Lite Ferry 3 was also acquired in 2006. This was the former Noumi No.8 in Japan and she became the second Santiago de Bohol in the Lite Ferries fleet. As an overnight ferry-RORO, the Lite Ferry 3 is small and she has just the external dimensions of a basic, short-distance ferry-RORO at 38.3 meters by 9.0 meters by 2.9 meters with a Gross Tonnage of just 250 but she has one-and-a-half passenger decks. The Lite Ferry 3 is now the shortest ship in the fleet of Lite Ferries. In 2007, Lite Ferries bought again a relatively big ship, the former GP Ferry-1 of George & Peter Lines which was the former small liner Sta. Maria of Negros Navigation Company. This was no longer renamed to a saint and she directly became the Lite Ferry 8. The ship was fielded to the Ormoc route to battle the Heaven Stars of Roble Shipping Incorporated which by then was having engine unreliability already. Soon after her rival was laid up, Lite Ferry 8‘s engines also began acting up also and so she was spending half of her time laid up. Lite Ferry decided to have her re-engined and the ship was used for Lite Ferry’s foray to Cagayan de Oro. The next year, in 2008, Lite Ferries purchased a second-hand LCT from the Socor Shipping Lines, the former LCT Socor 1. Like the Lite Ferry 20m she was over 50 meters in length at 55.4 meters but like the conventional LCT, her passenger capacity is small. She was initially named as LCT Sto. Nino de Bohol in the Lite Ferries fleet before she was renamed to Lite Ferry 22. In 2009, Lite Ferries made a decision to acquire double-ended ferries and this was a surprise to me given the nature of her routes which are not very short actually. In their routes, the double-ended ferries can actually suffer because of the drag and sometimes the lack of speed and their characteristic of having not to maneuver might just be negated. The Lite Ferry 9 which was actually a beautiful double-ended ferry was the former Daian No.8 and relatively new when acquired in 2009 because the ship was built just in 1997. She was not really small at 45.0 meters length, 10.0 meters breadth and 2.8 meters depth. Her Gross Tonnage was only 170 and her Net Tonnage is only 89 which is small. That is so because double-ended ferries cannot maximize their passenger deck up to the stern of the ship. Now this ship is no longer in the fleet of Lite Ferries and might have been sold elsewhere. In the Lite Ferry 10, another double-ended ferry, Lite Ferries tried to increase passenger space by adding scantling and bunks. With limitations this ship can also serve as an overnight ferry-RORO and there was not much of a problem with that since its route is only to Tubigon which is some two hours sailing distance away. The ships is also not that small at 46.0 meters by 10.0 meters by 3.8 meters with a Net Tonnage of 165. However, like in Lite Ferry 9, maybe double-ended ferries are not really fit for them and so Lite Ferries sold this ship to Medallion Transport in 2011 where she became the Lady of Miraculous Medal. Later, another Lite Ferry 10 came into the fleet of Lite Ferries which arrived first as a charter and later a purchase. This ship was the former Ocean King I of Seamarine Transport Incorporated. Ocean King I was an overnight ferry -RORO which abandoned the Liloan-Lipata route and then tried the Leyte route without going anywhere. Lite Ferries then took over her and Seamarine Transport became defunct. Lite Ferry 10 is bigger and has more capacity than the other overnight ferries of Lite Ferries because she has 3 passenger decks. In 2010, Lite Ferries acquired 4 surplus ferries. None of them was the expensive kind but as the norm in the Philippines those can be converted into valuable ferries and they were refitted simultaneously in Ouano wharf. The biggest of the 4 became the Lite Ferry 11 and this was the Misaki No.5 of Oishi Shipping in Japan. In international maritime databases, she is mistaken for the Lite Ferry 12 maybe because that is what reflected is in the AIS transmissions. The Lite Ferry 11 measures 65.7 meters by 15 meters by 3.5 meters but her Gross Tonnage of 498 in Japan shrank to 249 here even when decks were added. The Lite Ferry 11 is now the primary ship of Lite Ferries in the Ormoc route. The Lite Ferry 12 is a pocket overnight ferry-RORO with a registered length of just 41.6 meters, a breadth of 9.6 meters, a depth of 5.6 meters (which is rather deep) and just a Gross Tonnage of 249 which is low. This ship I found to be densely packed, so to speak. The Lite Ferry 12 rotates among many routes of Lite Ferries but she was the ship that opened the Nasipit-Jagna route for her company. There is no Lite Ferry 13 (nor a Lite Ferry 4) because those numbers are usually not used by local shipping companies out of superstition. There is also not a Lite Ferry 14 but I don’t know the reason for that. Maybe the owner is just averse to that number. The Lite Ferry 15 is almost the size of Lite Ferry 11 at 60.3 meters length, 11.4 meters beam and a Gross Tonnage of 827 with a Net Tonnage of 562. From twin Akasaka engines, she has 2,600 horsepower on tap which is higher than the 2,000 horsepower of Lite Ferry 1, Lite Ferry 6 and Lite Ferry 7 but below the 3,000 horsepower of Lite Ferry 11. Most of the time this ship holds the Cagayan de Oro to Jagna route of the company. The fourth ship to be acquired in 2010, the Lite Ferry 23 is very unique and there is no other of her kind in the country. It is a RORO and looks like an LCT from the side but it has a catamaran hull and so she is wider at 16.0 meters (her registered length is 57.5 meters). Attached and rigged to the stern before were two pusher tugs (in Japan those were free). Two funnels were attached to the ship here because there are now passengers. Modifications were made so a passenger deck could be added to the ship which is a little bigger than the average LCT. Initially, Lite Ferry 23 was a slow craft barely able to do 7 knots and so she was just assigned the Mandaue to Tubigon route which caters basically to rolling cargo. Later, the tugs were removed and she was given two decent engines and now she can do what a short-distance ferry can do. Still, she is doing the same route and basically catering to rolling cargo with a few passengers mixed in. 2011 was a respite year for Lite Ferries and they did not acquire any ship. But in 2012 they acquired the LCT Dona Trinidad 1 of Candano Shipping Lines, a Bicol shipping company. This ship first became the LCT Sta. Filomena de Bohol and like the other LCT in the Lite Ferries fleet she is over 50 meters at 53.5 meters. Shortly later, this ferry was renamed to Lite Ferry 21. In the same year 2012, Lite Ferries acquired a brand-new LCT from China, the Lite Ferry 25. Maybe this was the sign that in the future Lite Ferries will also be relying on this type of ship and mainly for rolling cargo with a few passengers mixed in. During this time China LCTs which are cheap (but which has questions on engine reliability) already had an allure for local shipping operators and maybe the Lite Ferry 25 was the test purchase of Lite Ferries from China. The size of this ship is almost the same as the other LCTs of Lite Ferries at 58.0 meters length. Some modifications to the ship was made to increase the passenger capacity. In 2012, Lite Ferries also ventured into HSC (High Speed Crafts) operation when they acquired the beautiful and modern-looking Japan fastcraft Lite Jet 1 (which are not powered by waterjets anyway). She was fielded in the Tubigon route where the new company Star Crafts was making a heyday. Maybe they perceived the fastcrafts of this company as a threat to their ROROs in Tubigon as it multiplied fast. The Lite Jet 1 was more modern and faster than the Star Crafts. Next year, in 2013, Lite Ferries acquired two more HSCs but this time from Vietnam. These were actually the former Aquan One and Aquan Two in Hongkong and they were the Nonan 1 and Nonan 2 in Vietnam and both were catamarans built in China. On conduction here one of the two grounded in the Spratly islands and it took longer to be fielded. The Aquan Two/Nonan 2 was named the Lite Jet 8 while the Aquan One/Nonan 1 was named the Lite Jet 9. These two catamarans proved problematic and hard for the technical resources of Lite Ferries which has not much HSC experience. MTU engines are fast but needs attention to maintenance and can be problematic when it gets old. This is the engine of of the Lite Jet 8. On the other hand, the Lite Jet 9 was powered by Isotta-Fraschini engines, a make not that well-known in the HSC field. That proved balky and slower and Lite Ferries tried to re-engine it with Caterpillar engines. Not long after, however, Lite Ferries completely gave up and sold all their High Speed Crafts including their good and reliable Oceanjet 1 to Ocean Fast Ferries Incorporated which operates the now-dominant Oceanjet HSCs. Maybe Lite Ferries realized that High Speed Crafts are not their cup of tea and they just better concentrate on RORO operations which they understand deeply as shown by their successful successful expansion. With this divestment, Lite Ferries bought out two Cargo RORO LCTs that came and challenged them in the Cebu-Tagbilaran route which was proving to be a serious threat to them. These were the Diomicka and the Maria Dulce which were just chartered ships. With the buy-out in 2015, the Diomicka became the Lite Ferry 26 and the Maria Dulce became the Lite Ferry 28. These 2 LCTs are the only ships in the fleet of Lite Ferries that do not carry passengers. With the remainder, in 2015, Lite Ferries continued the China experiment and purchased another brand-new LCT but which has a different design than the Lite Ferry 25. This was the Lite Ferry 27. It has a taller tower and and modifications were made so there will be two short passenger decks. Bunks were even provided (Lite Ferries is one of the shipping companies that combine bunks with seats). Like the Lite Ferry 25, this LCT is also powered by Weichai engines. At the same time of acquiring the Lite Ferry 27, Lite Ferries uncorked a new China experiment (well, their patron seems to really have strong China connections). Among these were two laid up Hainan Strait Shipping Company (HNSS) vessels that once connected Hainan island to the China mainland and which they acquired in 2015 and 2016. When the two arrived here they all looked very rusty but to the knowing they know once refitted the two will become beautiful and useful ferries (is there a rust that cannot be removed?). The two were renamed to Lite Ferry 16 and Lite Ferry 19 look to be modified LCTs with a car ramp at the bow and two partial decks of passenger accommodations below the bridge where one extend to near amidship which means the passenger area is far higher than the conventional LCT. With extensions of both decks that becomes passenger promenades, the feeling of being too enclosed in an LCT with nowhere to go is gone. Lite Ferry 16 and Lite Ferry 19 look to be sister ships. Two other rusty ferries from China which are sister ships also arrived for Lite Ferries in 2016, the Bao Dao 5 and the Bao Dao 6 which will become the Lite Ferry 17 and Lite Ferry 18. The two looks to be conventional ROROs with the bridge at the bow and with car ramps at the bow and the stern. When finished, at 89.0 meters length and 16.0 meters breadth, these two ships will give Lite Ferries a size that can already challenge the ships of Cokaliong Shipping Lines Incorporated and Trans-Asia Shipping Lines Incorporated and it is titillating to think where Lite Ferries intend to field the two. While three of these rusty ships were still being refitted, Lite Ferries also took delivery of another two brand-new LCTs from China, the Lite Ferry 29 and the Lite Ferry 30 which look sleek for an LCT. Slight modifications were also made in Ouano wharf to build passenger accommodations a la Lite Ferry 27. Right now these two LCTs which are obviously sister ships are now sailing. Currently at the start of June 2017, Lite Ferries have 23 ferries that are ROPAXes plus 2 Cargo RORO LCTs. Of the 23 ferries, 9 are passenger-cargo LCTs while 1 is a passenger-cargo catamaran-RORO. Lite Ferries might have started behind other Cebu shipping companies as they are a relatively new company but with their turbo expansion in the last few years they have already overtaken most other operators of medium sized ferries and not only in the Visayas. Aside from the old routes from Cebu to the Bohol ports of Tagbilaran and Tubigon and the route from Mandaue to Tubigon, the Cebu to Ormoc route is another old route that is a stronghold of Lite Ferries. That also includes the old route of Danilo Lines, the San Carlos-Toledo route. Lite Ferries also serves the Cebu-Tagbilaran-Larena-Plaridel route that was already abandoned by Palacio Shipping. They were also successful in the expansion to the Cagayan de Oro to Jagna route. However, their Nasipit-Jagna route seems to be little seasonal. Recently they also tried the Cebu to Cagayan de Oro route. Their Samboan to Dapitan route also proved successful as they offered a shortcut to the truckers that once had to go to Dumaguete first. They are also connecting Cebu to Negros with the Samboan to Sibulan route. A PSSS (Philippine Ship Spotters Society) member recently called and he was told the Dumaguete-Cagayan de Oro route is already off. But with such a great fleet now Lite Ferries is seriously needing to expand already and I just hope they go to the underserved routes. With many profitable routes already they can actually afford to experiment with new routes now. The expansion of Lite Ferries in the last 8 years is simply breathtaking with 17 ships added net. Lately their fleet addition even accelerated. They now have a critical mass and I will be watching where they will be headed. Liners like the old Bohol shipping great Sweet Lines? One morning I went to the foot of the SRP Road in Cebu to cover the remnant of the Sinulog fluvial procession. I just make do in that area because I will still see most of the participants and besides it is great effort to fight for a good view in the earlier parts of the fluvial procession. Anyway, it is in the vessels that I am more interested in. I was just in time. It was still early morning and there was a constant drizzle. But the position of the sun, the early morning and the drizzle made visibility and shots terrible. I have to make do with what is presented by nature. It seems more small crafts participated compared to the last time I covered the fluvial procession but less ferries going to Cebu port were forced to wait near the SRP. The Filipinas Iligan and the Oceanjet 6 were the only prominent ships waiting. There were motor bancas which stopped and disgorged the participants in the rocks by the SRP approach and I also covered those. The viewers did not stay long as the drizzle was continuous and there was no sight anymore in that areaexcept for the Coast Guard patrol ships, the Filipinas Butuan plus participant boats which were just idling. I then decided to make my way to Ouano-House. I called it such because it is there that the E. Ouano house is located. Actually it is more like an office (I have already entered it). And I doubt if it is the ancestral house of the Ouanos because from what I can gather it is also located on reclaimed land like the other facilities in the area. The jeep driver I rode was kind as he insisted on driving me to the wharf area. I appreciated it since there was a slight precipitation and I did not have to pay for a pedicab. The entry is easy as the guards didn’t mind. I thought it would be like that if the Lite Ferry LCTs to Tubigon have already transferred there. I might look like just one of its passengers. After the gate, however, it was a different matter. With the never-ending rains and the constant movement of trucks, the surface of the wharf area was already muddy though firm that one’s shoe will not get stuck. I was not surprised. If Ouano can’t maintain the road in the Ouano near the Mercado then they won’t maintain this one either. I thought FastCat would not have to worry for passenger competition to Tubigon. The muck here is already an advertiser for them. Ditto for the rolling cargo or vehicle loading trade. It was a maze to get inside because the only firm ground with no mud was occupied by the new Litexpress CHA-ROs parked and blocking the pathways. I would go in one direction and pull back because I can’t go on. Finally I had to cross the muddy road where the trucks roll. I ended up in the Star Crafts area but this time it was already too crowded because the future Lite Ferry 17 and Lite Ferry 18 were being refitted there and steel sheets, acetylene tanks, generators and other equipment were occupying the spaces. The only open area is the road going to Star Crafts and it is also muddy. The Lite Ferry 17 and Lite Ferry 18 are ROPAX LCTs that came from China. Those were former HNSS vessels already phased out. HNSS means Hainan Strait Shipping and that tells where it formerly plied routes. One of them arrived earlier and is already sailing here, the Lite Ferry 16 which looked like a sister ship of them. It looked derelict then like the two now docked in Ouano-House but as always Filipino ship repairers will make them look good again. Besides them was the new Lite Tug 1. It seems tugs are the vogue now of these competing overnight ferry companies. Roble have theirs already, Asian Marine Transport Corporation (AMTC) also got one, Cokaliong Shipping Lines followed suit and now Lite Shipping also have one too. Also there were Lite Ferry 26 and Lite Ferry 23. It seems those two were the ones doing the Mandaue-Tubigon route last December altho the latter is not the normal LCT but a catamaran-RORO (a slow one tho). Also there near the SMC Shipping and Lighterage facility was the brand-new Lite Ferry 30. It seems like what they did in the earlier Lite Ferry 27 they were building additional passenger accommodations. It looks like they are sister ships together with the Lite Ferry 29. I did not stay that long in that wharf. Sometimes it is the rain that makes you decide that. I left after my functional shipspotting and I have to go through the maze again but that was easier than navigating the mud in various parts of that wharf. I really wonder how the passengers make do with such situation. Is the cheapness enough to make them stick? I was able to see the tail end of their way out when one LCT just arrived. I saw no shuttle and here the walk to the jeepney terminus is even longer with less shade. Sometimes I cannot imagine in this era that such hardship can still be thrown to the passengers. Those LCTs, the wharf and the road were just really designed for trucks. Not passenger-friendly in any way. Maybe the FastCat and Star Crafts are a little more expensive but there is still the Lite Ferry 1 which also does a route to Tubigon. I also wonder. Why don’t the Super Island Express II just come back and maybe hold some off-hour schedule versus the Lite Ferry 1. Pier 1 might even have less expensive connections to the buses and jeeps of Cebu. Sorry not jeeps because that type is so few in Cebu. What I mean are the AUVs, Multicabs and converted Elfs and Canters of Cebu. From the wharf I made my way to the old Villa Shipping wharf which was just rented from Ouano. I was glad the K-9 guard of Ouano was not there. Their compound was closed and it seems no one is around. Good. I can approach their Elvira-1 and take shots. I wonder why they were too jealous of this old, derelict and bad-looking now former hydrofoil converted into a fastcraft which did not last in service. They should even be glad someone is taking interest. It seems they have a different psychology from us. There were no more Villa ships there and it seems they have already left as I can see no more ships and facility of them there. What was docked there was the West Ocean 1 of Ocean Transport. I can’t make of the the jumble there. It seems different entities are using that area and not all are connected to shipping. It was at the far end where I was interested because I want to go near the Lady of Love of Medallion Transport which has not been sailing for some time already. Got some shots but it was not easy as the rain got heavier. Beyond Lady of Love the LCT Poseidon 19 was also docked. Last December this ship was still running the Matnog-Allen route for NN+ATS as a Cargo RORO LCT. Primary Transport Solutions owns this vessel and NN+ATS only charters it. Again I did not stay long. On the way out I took shots of the old derelict F/C Magallanes, a fastcraft for private use. I was told before it was a Durano gift to Ouano. I did not know enough of Cebu politics and shipping of before to work out how that happened. All I heard was before Durano has shipbuilding and was a Cebu shipping player. In fact one of their derelicts is there in Labogon by the Goldenbridge wharf. I thought Ernesto Ouano was lucky (except he died prematurely). Well, just to have a big reclaimed area near Cebu, how much is that in legacy worth? Plus their wharves. It is practically a Lite Ferries wharf now but Lite pays them. They are rich just because of the payments for the use of the wharves. But later it seems F.F. Cruz and Lua stole their thunder in Cebu reclamation. And I don’t think they are players in the future Cordova reclamation. But still they are very lucky. I no longer pushed my ship spotting that day. Too much rain and I am not a farmer. Rain would have been nice in April but the programmer is a little awry. But the next day I came back to the same area but this time my targets were Pier 8 and Pier 7. It was a Sunday and there was no activity there past CDU. I first asked the guard of Ravago/Asian Shipping Corporation. A little canine too but I didn’t mind, didn’t press. Can’t call their GM as all mobile lines of Metro Cebu were down to prevent bombing. I was really more interested to see what was the denouement in the AMTC (Asian Marine Transport Corporation) eviction case nearby. The AMTC yard was deserted now along with the Dakay Construction yard which was also part of the AMTC lot that was in dispute with F.F. Cruz through the MARRECO entity. MARRECO sought the eviction of AMTC for non-payment and they won in the court. MARRECO then blockaded the facility to prevent AMTC from using it. And AMTC left and transferred to Ouano after a failed bid for the Talisay fishport. The guards by MARRECO there were suspicious but they told the reason why the Super Shuttle RORO 8 was docked there last December was to take in all AMTC materials left that can still be loaded. But I don’t really know why Super Shuttle RORO 3 and Super Shuttle RORO 2 were also there last December. The two had long been just anchored and not sailing for the best part of 2016. From there I made my way to the Roble wharf. The left side of that if facing to the sea actually belongs to F.F. Cruz and it is where aggregates carrier LCTs and barges dock. The right side belongs to Roble Shipping. There were three newly-arrived freighters there and I was told two belongs to the scions already. There was also the many docked ships of Roble including the non-running ones. The Ormoc Star was there. She is really ready now for the breakers. On the far end was the fire-hit Wonderful Stars where no work is going on. It was lonely in that area on a Sunday Sinulog. Almost no people and movement. I caught a jeep going to Mactan and then I walked again the old Mactan bridge. From there I took a Multicab to Muelle Osmena and took the Metro Ferry. The light was dying when I reached Pier 3 and that ended my ship spotting for that day. The Jadestar Tres and Jadestar Seis were once small short-distance ferry-cruisers by Philippine Ship Spotters Society (PSSS) definition. These two are sister ships and before they plied the Cebu-Tubigon short-distance route for Jadestar Shipping Lines. This company has folded now after initial success and these sister ships are the only ones still sailing from the old Jadestar fleet although in different capacities and in different places now. Among the two it was Jadestar Seis that was built earlier in 1982 and she was originally known as the Tsuya Maru. Jadestar Tres was built in 1984 and she was first known as the Sei Maru. Both ships were built by Nagasaki Shipyard & Machinery Works in Nagasaki, Japan. Tsuya Maru/Jadestar Seis has the ID IMO 8204377 and Sei Maru/Jadestar Tres has the ID IMO 8408117. Jadestar Tres had the local Call Sign DUH 2428 and Jadestar Seis had the local Call Sign DUH 2436. The closeness of the two call signs means they arrived in the Philippines not far apart and of course the Jadestar Tres arrived first. Both ships arrived in 2005 and were once the workhorses of Jadestar Shipping in the Cebu-Tubigon route together with the Jadestar, the first ferry of the company as the Jadestar Nueve and Jadestar Doce did not play prominent roles for the company. Maybe that was because their different designs might not have been well too-suited even from the start (Jadestar Nueve, a former Hongkong ferry was very tall and sways in the Bohol Strait wind and Jadestar Doce was a Low Speed Craft catamaran). It was the three which then can be usually found in docked in Pier 3 or sailing in Bohol Strait with their distinctive red livery. The two ships have steel hulls with raked stems and transom sterns. The sister ships have a single mast, two low funnels and two passenger decks. As cruiser ships, they did not carry vehicles and hence they did not have ramps for rolling cargo nor did they have car decks and this could have what was fatal to their careers in the Cebu-Tubigon route. The sister ships had the same external dimensions at 36.0 meters LOA, 33.2 meter LBP, 7.2 meters breadth and 2.9 meters depth. However, Jadestar Seis‘ GT (gross tonnage) is 225 while that of Jadestar Tres is only 172. The NT (net tonnage) of Jadestar Seis is 116 and that of Jadestar Tres is 101 (these are nominal numbers and no “tons” are attached). The DWT (deadweight tonnage) of Jadestar Seis is 50 tons while the DWT of Jadestar Tres is 53 tons. Jadestar Seis has a declared capacity of 502 persons while that of Jadestar Tres is 512 persons. These are all in sitting accommodations. The sister ships are both powered by single Daihatsu engines of 1,000 horsepower and they have a design top speed of 12 knots. However, in Bohol Strait they were usually doing 10 or 10.5 knots only. The sister ships have an airconditioned Tourist class accommodation at the front of both the upper deck and the lower deck, the original passenger accommodations in Japan. At the rear of those are the open-air Economy accommodations. Some luggage and cargo can be stowed in the rear of the lower deck above the open engine room which is noisy (and so passengers avoid that area). However, few take the Tourist class as anyway the aircon and the smell were not first rate and nor are the seats. At the start of their passenger operation in 2004, Jadestar Shipping found early success as people of Bohol are wont to going to Cebu for their needs. Cebu is also the transit point for many coming from other places like Mindanao if they are going to Bohol. Bohol’s tourism was also picking up and there are many Bol-anons studying or working in Cebu. Tubigon was also fast developing to be the alternate port to Tagbilaran and actually it was a cheaper alternative as it was nearer to Cebu at only half of the distance to Tagbilaran. However, things always change and sometimes paradigm changes happen that upsets the old order of things. 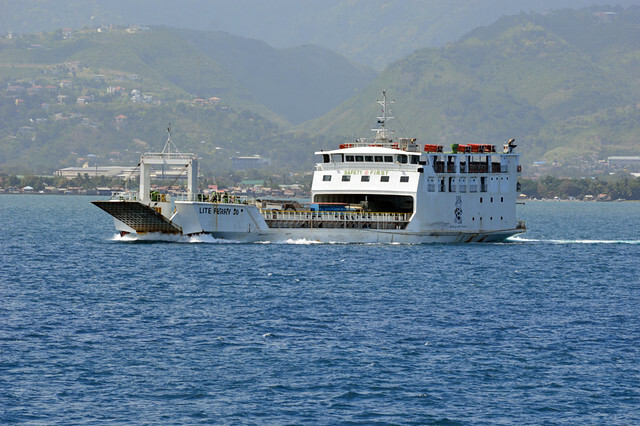 Lite Shipping, buoyed by many and fast ship acquisitions fielded the double-ended RORO ferries Lite Ferry 9 and Lite Ferry 10 in the Cebu-Tubigon route in 2009. 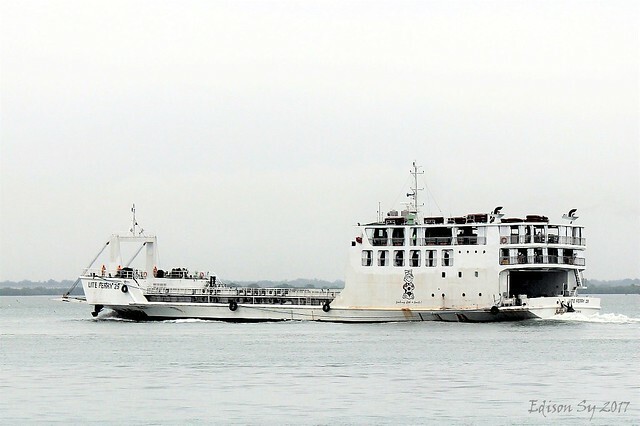 Their challenge to the route was also tightened by the fielding of the Lite Ferry 22, a ROPAX LCT and the Lite Ferry 23, a low-speed catamaran RORO in the Mandaue-Tubigon route. These two were concentrating on the rolling cargo (i.e. vehicles) to Bohol. Since rolling cargo revenue far outweighs passenger revenues (while rolling cargoes also bring passenger revenues from the vehicles’ passengers) these ROROs can run with less than half full of passenger load as long as they have a good load of vehicles. And Jadestar Shipping do not have that advantage since their ships are cruisers. Cruisers, by its very nature cannot carry a significant amount of cargo, even loose cargo. In 2010, the Star Crafts fastcrats of Malaysian origin began appearing in the route. At double the speed of the Jadestars they can do the Cebu-Tubigon route in just an hour versus the two hours of the Jadestar while the fare is not double. This proved to be a big come-on especially since the Star Crafts were airconditioned. The aircon vs. aircon fare difference of the competitors was actually not big but the speed difference and transit times were great. Come the second decade of the new millennium Jadestar Shipping was obviously being squeezed by Lite Shipping and by Sea Highway Carrier (including its legal-fiction companies), the company of the Star Crafts fastcrafts. One disadvantage of a shipping company with only one route like Jadestar Shipping is there is no other route that can buoy up the company if squeezed in one route. The Island Shipping Corp. cruisers were also being squeezed in the route but that company has a strong presence in the Cebu-Bantayan island route. By 2012, Jadestar Shipping was already kaput, a victim of declining patronage and of revenues not enough to sustain operations. They stopped sailing and brought their ships to the shipyards. The useless Jadestar Nueve and Jadestar Doce were also sold for scrap. Once in a while, some PSSS ship spotters would view them in Tayud using ultrazoom or superzoom cameras. The distance was far. In 2013, a Jadestar was first espied in the PPA vessel arrival/departure site. It carried the name Jadestar Legacy. A check by a PSSS Admin proved she was Jadestar Seis (the name is etched in the hull) in practically the same livery. Only the name “Legacy” was added but she was now registered in Zamboanga. Further check showed the seats in the rear of the lower deck were removed so more cargo can be stowed. There is more amount of cargo in Zamboanga than in Bohol. The ship is now owned by Ibnerizam Shipping and she is doing the Zamboanga-Isabela City, Basilan route, an even shorter route than the 22 nautical miles of Cebu-Tubigon at only 14 nautical miles. Her passenger load in the new route is stronger. She has a very old, salty captain who was too fearful of the owner who is always aboard. This is the only captain I met who is not appreciative of a ship spotter admiring his old smoky bathtub. The old cruiser is now down to 8 to 8.5 knots although at times she would take two hours on the route if the sea is rough or the sea is against her. Meanwhile, while visiting Nagasaka Shipyard in Tayud, Cebu my fellow ship spotter from PSSS suddenly recognized a ship now in green livery being refitted and converted. I was not sure of the identification but he was certain. Then the engraved name came. Sure she was the Jadestar Tres and she was being converted into a Gemini ship, the Gemini 10 specifically. This company is known for having cargo ships that look like passenger-cargo cruisers. 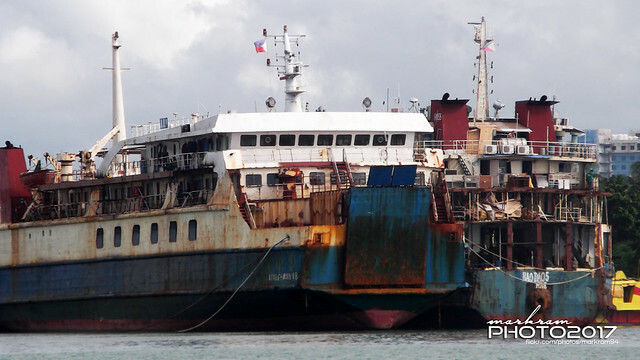 It is owned by Wellington Chan Lim of Isla de Bantayan Shipping. In a few months, ship spotters began seeing her between Pier 2 and Pier 3 in Cebu near the Lapu-lapu Shipping ferries in the cruiser ship row of Cebu Port. There is wide vacant spaces in the upper and lower decks. She loads cargo in boxes and also day-old chicks, among other goods. She supposedly does a route to Masbate. Her schedule to Cebu is irregular and it cannot be predicted when she will appear there. Maybe she is also sails to the other islands and ports. These sisters are now just the survivors of the Jadestar Shipping fleet which even had a cargo ship before, the Jadestar Dos. Somehow, it is heartwarming that they are still sailing and did not end up as plain scrap metal.